Other Latin name: Ixophorus italicus (L.) Nash. 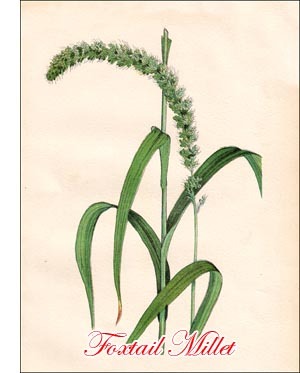 Foxtail Millet is an annual with rather stiff and erect stems, ordinarily from two to four feet high. but sometimes reaching a height of six feet or more. The leaves arc broad and somewhat similar in size and texture to those of Common Millet. From the latter, however, this plant is easily distinguished, even when very young, by its lack of hairiness. The inflorescence is a contracted panicle, often nodding at the top; on account of its short branches it resembles a spike. Its lower branches, as a rule, are not so close together as the upper ones. The spikelets are crowded and mixed with stiff bristles, the latter representing branches on which no spikelets are developed. These bristles are generally long and often reddish or purplish. They give the panicle the appearance of a foxtail, which is the common name for cultivated millets belonging to the genus Setaria. Each spikelet contains only one flower with a yellow pistil. It is generally assumed that Foxtail Millets developed in prehistoric time from Green Foxtail or Pigeon Grass (Setaria viridis (L.) Beauv. ), which in many parts of Canada is a troublesome weed; but there seems to be no conclusive proof of this. At any rate, its cultivation goes very far back. It is one of the five holy plants which, according to a command issued 2700 B.C., were sown each year by the emperor of China at a public ceremony. At present it is grown extensively in Central Asia, northern East India, China and Japan. It is also cultivated in southern and eastern Europe, but is there of only secondary importance. There are a great many so-called varieties of Foxtail Millet, most of which, however, are not varieties in a botanical sense and are therefore not clearly defined. So-called German Millet illustrates this fact. This variety is so variable in appearance and habit of growth that practically no field is uniform. Hungarian Millet or Hungarian Grass, Japanese Millet, Siberian Millet, Golden Wonder, Holy Terror, Gold Mine, etc., are more or less distinct varieties and yet are not really uniform within themselves. Foxtail Millet is an important food plant in many parts of Asia, especially in northern China, where the seed is ground and used for porridge. In America it is not used for human food. The best time to cut for hay is when the majority of the plants are in bloom, as the nutritive value of the stems and leaves is then greatest. When the plants begin to blossom, the bristles of the spikes are still soft and harmless, but when the flowering period is over they become stiff and harsh, produce more or less irritation in the digestive tract of the animals, and are said to sometimes form compact balls in the stomach, causing serious trouble or even death. When used for pasture, millet should be grazed before the heads are formed. When grown for hay or pasture, thirty pounds of seed should be sown to the acre; when grown for seed production, twenty pounds are sufficient.